Kendall Toyota of Eugene is proud to sell and service Toyota vehicles in the greater Eugene, OR area. With models like the new Toyota Camry, Toyota Prius, and Toyota Tacoma, we have something for every taste and budget. Browse our new Toyota inventory to check out the model you’ve been eyeing. If it’s a used car, truck, or SUV you’re looking for, Kendall Toyota of Eugene has a huge selection of Certified Pre-Owned vehicles too. In addition to car sales, Kendall Toyota of Eugene’s Service Department will keep your Toyota running in top condition for years to come. Looking to upgrade the performance of your Toyota Tundra? Your local Toyota dealership offers genuine Toyota parts and accessories. Visit the Kendall Toyota of Eugene Finance Department and our financial experts will help you to secure a car loan, getting you financed is our goal! Be sure to save time by filling out our finance application for pre-approval for a Eugene auto loan. Kendall’s General Manager David Noonan and the team are committed to complete customer satisfaction and are confident they can help you find exactly what you’re looking for. Even though we offer big city savings and selection, you can always count on us to be your hometown dealer. Kendall Toyota of Eugene is dedicated to being a socially responsible business by lessening our environmental impact. 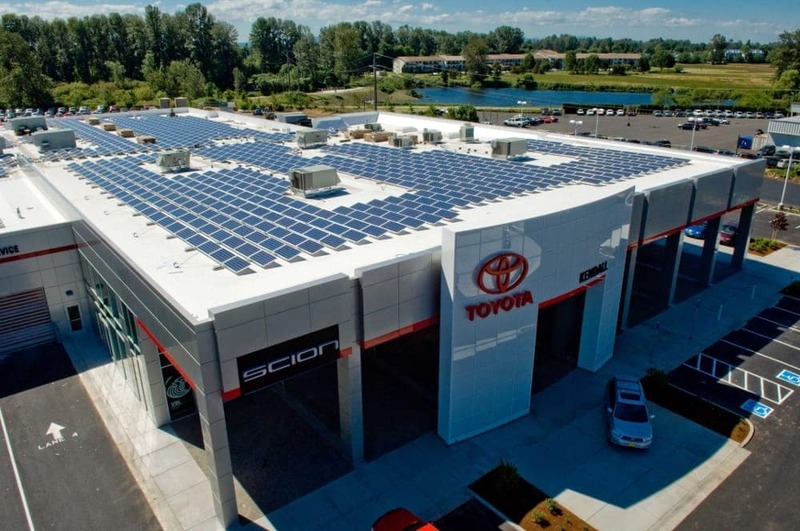 The Kendall Dealership in Eugene features a solar panel system designed to generate 30 percent of its own energy. We’re the first auto dealership on the World to achieve LEED Platinum certification for green building standards. Kendall Auto Group traces its roots to 1937 when Merrill Kendall became part of the Simmons-Kendall Company, a Ford dealership in Eugene, OR. In 1963 Walter DeMartini bought and created Kendall Ford, Inc. The Kendall company has remained a family-owned business since then.